Review posted October 7, 2015. Tundra Books, 2015. 96 pages. This book makes me laugh. The premise is simple: It’s the stages of grief as experienced by a fly caught in a vacuum cleaner. Yes, this would be helpful for explaining the stages of grief to a child. But it’s also just plain fun. Although it’s long, there aren’t a lot of words on each page, and the lavish illustrations do most of the work of telling the story. Now, the book is made less bleak in that the fly eventually does escape, as the vacuum is hauled to a dump and breaks open. There’s a parallel journey involving a dog and its stuffed toy – and the dog gets distracted while the toy ends up part of a bird’s nest, so we are given an alternate ending. 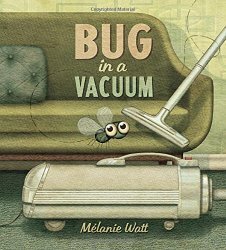 You might think that a lot of pictures of the inside of a vacuum would get old, but Mélanie Watt knows how to add details to keep you occupied many times through the book. This isn’t exactly a book for storytimes – but it is a book that could be used as bibliotherapy – but is also an engaging, brilliantly illustrated, and entertaining story totally apart from its teaching value. And since I consider few things worse than a didactic book that is not entertaining, as far as I’m concerned, that’s a big win.